Like many of Coley’s works, the sculpture forces us to consider our position in the world and to question the authority with which statements are made. The viewer is confronted with a series of unsettling questions: Why is this here, next to the Cathedral? Does this mean that Heaven is boring? Is the idea of nothing ever happening a good thing? Is it an official proclamation? What do I do with this information? At every juncture, Coley is placing the onus of engagement onto the viewer. There is no prescriptive sense of what the answers might be, it is the process of critical thought that is important. The location of the work, adjacent to Lund’s world famous 12th century Cathedral, creates the conditions for a conversation about the relationship between the rational and the spiritual in contemporary society. In presenting the work, Coley may be posing a theological question: ‘Once transcendence is achieved, what else is there left to do?’ On the other hand, the statement might be reassuring, presenting an idea of the afterlife as a place in which nothing changes and peace prevails into infinity. The work encourages us to query our assumptions about time and space and consider what might lie beyond these categories. For all his text sculptures, Coley appropriates quotes and statements from historical documents, popular culture, radio programmes and conversations. The wording, and title of ‘Heaven Is A Place Where Nothing Ever Happens’, is taken from the lyrics of a Talking Heads song from 1979. The work assumes new meaning according to its context. It has travelled to Lund from the Kunstmuseum Kloster in Magdeburg, Germany, an 11th c. Romanesque building. Before that, it was installed on a rooftop in the English seaside town of Folkestone. In Lund, it will develop its own story, no doubt enriched by its location next to Sweden’s most visited church, adding significantly to its cumulative narrative. Our programme of commissions has been devised to bring a public focus to our activities and to encourage debate and engagement locally, nationally and internationally. 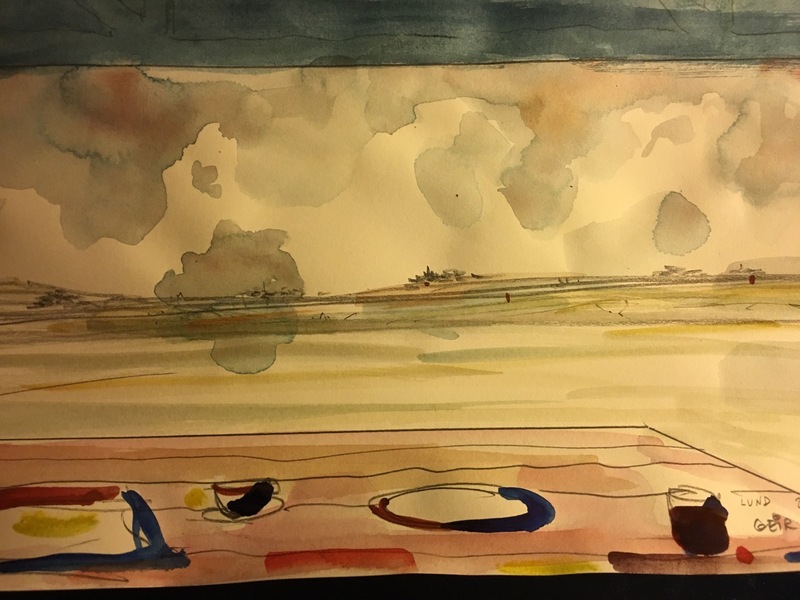 Each of the artists and architects we commission bring with them their own set of questions and provocations; our aim is to feed these responses into the long-term development programme as it evolves. These commissions are also important tools for the Råängen team, providing opportunities to test ideas and broaden the conversation. We are delighted that British artist Nathan Coley accepted our invitation to be the first artist to be commissioned for the Råängen programme. Coley is an internationally renowned artist who is interested in belief systems and how the values of a society are articulated in the architecture and public spaces it produces. He uses architectural forms and text works to unearth social, political and ideological structures. To mark the beginning of our conversation with Lund residents and visitors, an existing lightwork by Coley was installed adjacent to Lund Cathedral. Coley’s new work for the Church’s land in Brunnshög was installed in June 2018 to March 2019. ‘Heaven’ installed for the launch of Råängen, November 2017. Photo: Peter Westrup. 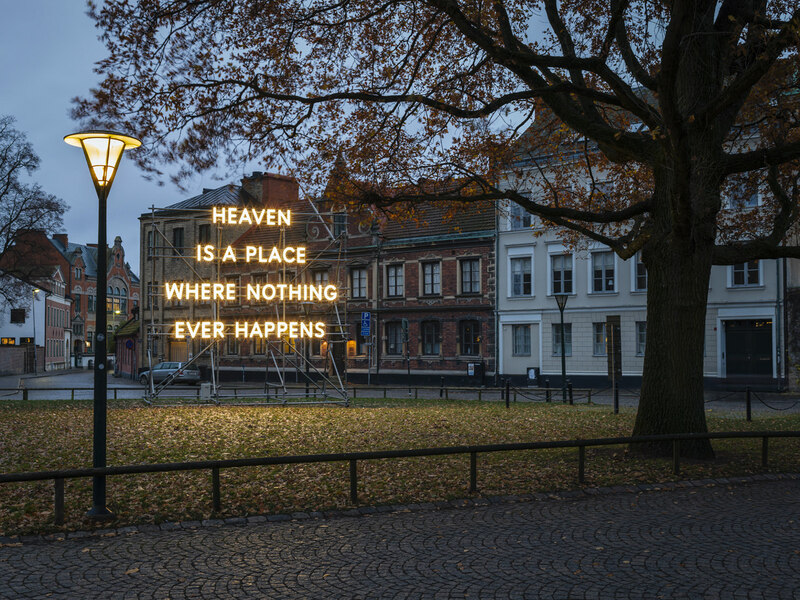 Nathan Coley’s sculpture ‘Heaven Is A Place Where Nothing Ever Happens’ was installed on Krafts Torg, between Lund Cathedral’s apse and the Bishop’s house from November 2017 to March 2018. View a film about the work here. ‘And We Are Everywhere’, 2018. Photo: Peter Westrup. 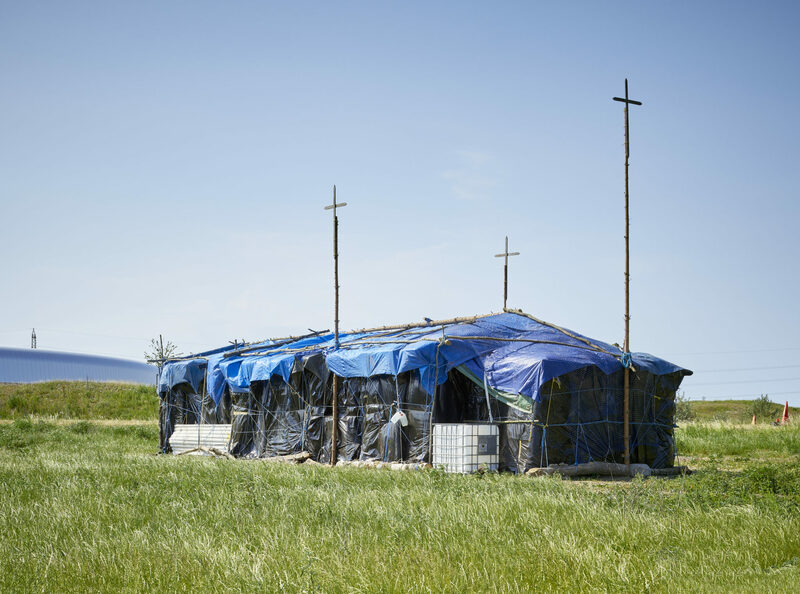 A major new commission by Nathan Coley for Brunnshög was launched in June 2018 and remained on site until March 2019. Read a text by Jonatan Habib Engqvist here. Geir Brendeland and Olav Kristoffersen have developed a wide-ranging practice over the past fifteen years, designing exquisite buildings, teaching students, and thinking through the implications of building in the 21st century. Mainly known for their ambitious and unique approach to housing, urban development and social provision, they have also worked on temporary, sometimes peripatetic, projects including exhibitions, installations and public interventions. Both Brendeland and Kristoffersen teach in the Faculty of Architecture and Design at the Norwegian University of Science and Technology in Trondheim, Norway, which situates their practice within a critical discourse. Their interest in Råängen stems from a broad commitment to a common good as well as long-term engagement in issues relating to land ownership, communal ways of living, vernacular architecture, craft and local materials. Many of their projects involve communal activities that involve a broad range of people, including teenagers, children and adults. Their public space for Råängen will help set the tone for future development on the Church’s land in Brunnshög and will involve collaboration with Lund Municipality and the University. Norwegian architects Brendeland & Kristoffersen have been appointed to design a public space for Brunnshög that will encourage visitors to explore the site and develop a way of thinking about the extension of Lund. The garden will be the first permanent commission for the Råängen programme and will be open to all. Over the coming years, a new neighbourhood will grow up around the space, which will shift from being an object in the landscape to a local park for a new community.